Novo Cinemas, a leading homegrown cinema chain, recently hosted its very first big screen gaming session at its 7-star screen in Seef Mall, Bahrain. In a bid to increase Event Cinema opportunities from streaming live sporting action to hosting independent workshops, Novo invited famous Bahrani YouTuber ‘Spooki’, known for reviewing video games and with over 2million subscribers, to the ultimate big screen experience. 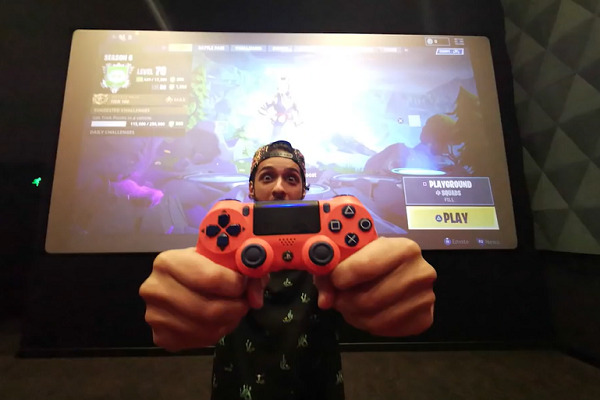 Taking place within their 7-star screen at Seef Mall; Bahrain, Spooki had the entire 44 seat cinema to himself where he battled it out in the most talked about game of the year, Fortnite, said a statement from the leading cinema chain. Boasting Dolby Atmos sound, which provides moving audio with sound that flows around and above to create a powerful experience, the cinema came to life with vivid gaming action reflected on the 6-metre screen, it stated. With this first big screen gaming session, Novo Cinemas, the brainchild behind innovative F&B creations and eclectic independent screenings, has broken the mould again, said its top official. “Our constant approach to changing the way traditional cinema is perceived has meant that Novo is an ever-changing brand and in line with our customer demographics at all times,” remarked CEO Debbie Stanford-Kristiansen. “Having one of the most famous YouTubers in the Middle East to exclusively take part in the very own gaming experience bolsters our commitment to becoming the leaders in innovation. We are continuing to pave the way as market leaders when it comes to introducing new technology and bespoke experiences such as this,” she added. Since 2014, Novo Cinemas has been a pioneering entertainment destination offering visitors an unforgettable cinematic experience. Bringing more than movies to the big screen, Novo Cinemas is committed to providing every community a mix of bespoke entertainment options across a variety of viewing platforms including the indulgent 7-Star VIP theatres, action packed MX4D screens and Imax with Laser in the UAE and Mena region, said the statement from the company.